Plundering the ovaries of dead baby girls: Coming soon? What better way to completely strip people of their humanity? There’s been some buzz this week about a scientific discovery that can help the in vitro fertilization (IVF) process: for about ten years, doctors apparently have had the ability to harvest the eggs of aborted baby girls and use them to aid women who have difficulty conceiving. But the story resurfaced this week, affording the opportunity to talk more about the disconcerting practice. It comes as little surprise, for a procedure that is wont to constantly and consistently put the desires and preferences of parents before the humanity of their children, that the newest contribution to IVF science involves ravaging the bodies of murdered babies for their spoils. Scientists are ready to plunder the ovaries of aborted babies for eggs to use in IVF treatment. They raise the nightmare prospect of a child whose biological mother has never been born. The news, from a scientific conference in Madrid, was greeted with widespread revulsion at how far science is testing ethical frontiers. It’s comforting to know that widespread revulsion has been the reaction to this procedure. 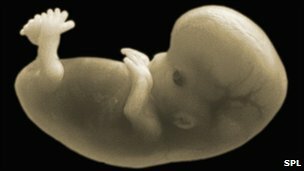 But the fact is, it is not out of step with other commonplace practices surrounding IVF, such as the selective reduction abortions and the discarding of fertilized eggs mentioned earlier. If taking babies’ lives weren’t enough for the pro-abortion community, now we may be ravaging them in a utilitarian quest for gain that overlooks everything human about preborn human beings. Help to spread awareness about the abortion-related practices of IVF. If you have a friend or relative who is considering the practice, alert him or her of this new technology and other ways in which innocent human life may be compromised by the procedure.